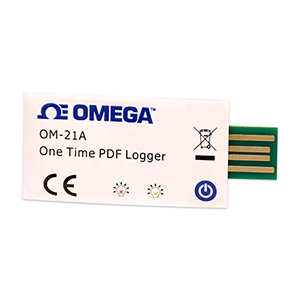 The New EN12830 & FDA 21 CFR Part 11 Compliance OM-21A PDF data loggers are ideal for monitoring the temperature in cold chain type of transport, storage, and testing process. Easy to do the recording by pressing a button to start and stop. True Plug and Play Experience by plugging into a USB slot on any computer to get the PDF report directly without any software and driver installation requirement. This data logger is used mainly to monitor and verify temperature sensitive goods, equipment or areas. Applications: Cold Chain, Refrigeration, Transportation, Warehouse, HVAC, Food and Pharmaceutical. Note: The new programmable model OM-21A-P-10PK allows end user to configure the Sampling Rate, Alarm Range and Delay Times with the free download software.